The Lakes at Thousand Oaks is a 7 1/2 acre, 48,000 square foot development next to the Thousand Oaks Civic Arts Plaza where you can relax and enjoy park-like landscaping, two lakes, fountains, waterfalls and a children's play area, while grabbing a bite and do some shopping. The Lakes opened in 2005. Restaurants include P.F. Changs, California Pizza Kitchen, Sabor Cocina Mexicana and Umami Burger as well as Sunlife Organics. Rounding out the offerings are a Lassen's Health Foods, Brighton Collectibles, BCBC Nails Spa, Kalologie Skincare and Tommy Bahama. The Lakes at Thousand Oaks is really a beautiful, peaceful place, daytime and nighttime. There is a kids club that meets every Wednesday morning from Spring through Fall. The Lakes hosts a very popular outdoor ice skating rink. Younger ones enjoy it here because there is a lot of room to run around, run across the bridge, around the lake, etc. 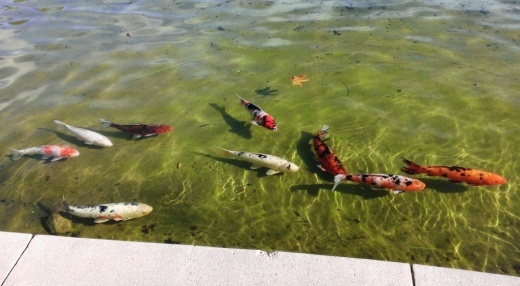 We like the koi at The Lakes. They're cool to watch. But we don't feed them as cute as they are as they are obviously well fed! The Lakes is located at 2200 E. Thousand Oaks Boulevard. Visit www.shoplakes.com or call 805.497.9861 for more information. The Lakes Memory Lane: Former tenants at The Lakes include Claim Jumper (closed 2/23/14; now Lassen's), Nate 'n Al Deli (closed 1/4/12 in space now occupied by Umami Burger), Sushi Ko (2005 to August 2009 in Umami Burger space), Coffee Bean & Tea Leaf (closed 7/18/11), Blizz Frozen Yogurt (closed early Spring 2011), Ben & Jerry's and 9021Pho (July 2016).